A favorite getaway choice in summer for many Americans is a visit to a national park. Acadia National Park, located in Bar Harbor, Maine is the only U.S. national park in the northeastern United States. While not as large as the national parks in the West, Acadia’s scenic beauty and coastal location makes it a popular choice for visitors from around the world. Fortunately, visitors who don’t want to drive can easily enjoy Bar Harbor and Acadia National Park. Be sure to plan your trip here between June 23 and the second Monday in October (Columbus Day) when the free Island Explorer buses can take you nearly anywhere you want to go in Bar Harbor, Acadia National Park, and other popular spots on Mount Desert Island. Because the Island Explorer begins operating on June 23, this month’s Car Free Journey spotlights Bar Harbor and Acadia National Park. Bar Harbor is a town on Mount Desert Island in Hancock County, Maine, and is home to 5,235 residents, according to the Census Bureau. The town is best known as the home of the largest parts of Acadia National park, including Cadillac Mountain. This mountain’s peak is the highest point within 25 miles (40 km) of the eastern United States coastline. The community of Bar Habor was first settled by Europeans in 1763 and incorporated on February 23, 1796 as Eden, after Sir Richard Eden, an English statesman. In the 1840s, its rugged maritime scenery attracted artists Thomas Cole, Frederick Edwin Church, William Hart, and Fitz Henry Lang, and encouraged journalists, sportsmen and wealthy vacationers to come here. On March 3, 1918, Eden was renamed Bar Harbor after the sand and gravel bar, visible at low tide, which leads across to Bar Island and forms the rear of the harbor. It was the birthplace of former vice-president Nelson Rockefeller who served under President Gerald Ford from 1974-1977. Many influential people have called Bar Harbor home for at least part of the year. These include: J. P. Morgan, Cornelius Vanderbilt, the Astor Family, and William Howard Taft (27th President of the United States: 1909-1913). John D. Rockefeller Jr. donated about one-third of the land in Acadia National Park and built the carriage roads that are used for hiking and biking. Current local celebrities include: Roxanne Quimby (co-founder and CEO of Burt’s Bees), Martha Stewart, and movie star John Travolta. Architect Fred L. Savage started out on Mount Desert Island, moved, and then returned to design houses for many wealthy people in Bar Harbor. Bar Harbor is a destination for tourists from all over the world. Cruise ships dock in its harbor from May through October. The town is the eastern terminus of the Adventure Cycling Association’s Northern Tier Bicycle Route (which ends in Anacortes, Washington), and the northern terminus of its Atlantic Coast Bicycle Route (ending in Key West, Florida). Bar Harbor is heaven for outdoor enthusiasts. Downtown Bar Harbor comes alive with adventure seekers during summer and fall. Since Acadia National Park is only a couple of miles from downtown, there are plenty of ways to experience the park. Outdoor activities in Acadia include hiking, biking along the carriage roads, bird watching, and mountain climbing. The wealth of the National Park can be easily accessed via the free Island Explorer shuttles that operate during the tourist season. Those interested in the marine life surrounding Mount Desert Island can go to the marina at the end of Main St. and sign up for tours to see puffins, whales, lobster, seals, eagles, pelagic seabirds, or island lighthouses. Acadian Nature Cruises (http://www.acadiannaturecruises.com or call 207-801-2300) offers a way to learn about the marine wildlife and birds of Frenchman Bay narrated by retired park rangers. The Bar Harbor Whale Watch Company (www.barharborwhales.com or call 207-288-2386) offers tours on the Gulf of Maine that allow you to view thousands of nesting birds, including puffins and oceanic seabirds, as well as dolphins and humpback whales. Low tide exposes a sand bar from town to Bar Island wide enough to drive a car across. Although cars are not allowed on the sandbar, the bar provides entertainment for those looking to go shelling or just to see what is uncovered when the water retreats. This exposed land also provides an excellent launch point for kayakers. In 2012, the American Planning Association selected Bar Harbor’s Village Green as one of their top ten Great Places in America for Public Spaces. Come during the summer and early fall, when the free Island Explorer shuttles operate. Walk around the town. Ride the free shuttle into the national park or to other nearby villages on Mount Desert Island, such as Southwest Harbor, Northeast Harbor, and Bass Harbor. 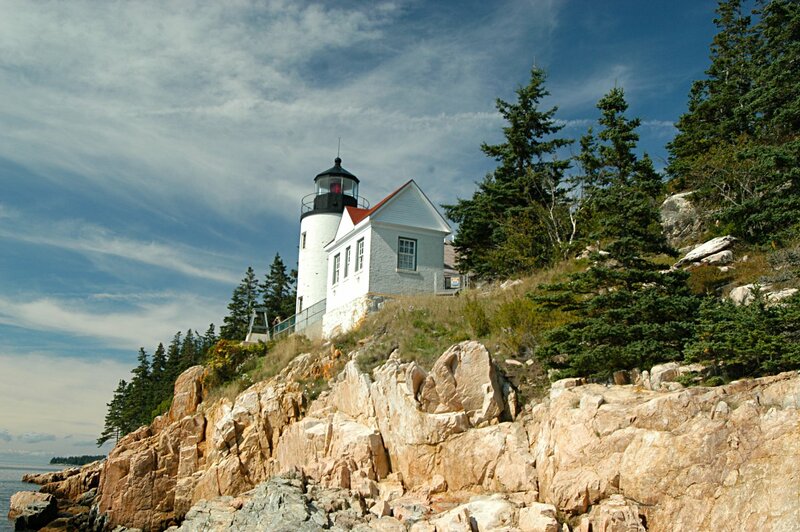 (The Bass Harbor Head Lighthouse is one of the most photographed lighthouses in the United States). Guided summer tours highlight Thunder Hole, Otter Cliffs, and Cadillac Mountain—three of the national park’s top scenic attractions. Visit www.exploreacadia.com/guide.htm for detailed information about how to get to Bar Harbor by air, bus, and train. The largest airport near Bar Harbor is Bangor International Airport, which is approximately a 1.5 hour drive from Bar Harbor. Delta and U.S. Airways offer non-stop flights between Bangor and Detroit, New York City’s LaGuardia, Philadelphia (PA), and Washington D.C.’s Reagan National Airport. Allegiant provides flight service, several days a week, to the Florida airports of Ft. Myers/Punta Gorda, Sanford/Orlando, and Tampa/St. Petersburg. The Bar Harbor Shuttle (www.barharborshuttle.net, or call 207-479-5911) operates year round service between Bar Harbor, Bangor International Airport, and the Greyhound and Concord Coach bus terminals in Bangor. Up to four round trips operate daily between April and November. There is no set schedule. You simply make an online or phone reservation, based on when your flight or bus will arrive. The cost for one person is $45 one-way and $85 round trip. For two people, the cost is $40 per person one-way and $75 per person round-trip. The trip takes 1.5 hours each way. A less expensive option, available only on Monday and Friday afternoons (except on Monday holidays), is Downeast Transportation’s bus from Bangor International Airport (with a stop at the Concord Coach bus terminal in Bangor) to the Bar Harbor Village Green. No reservations are required. The cost is $9 each way, and exact change is required. Be sure to tell the driver to let you off at the Bar Harbor Village Green. The bus leaves Bangor International Airport at 2:30 p.m. The return trip (also on Mondays and Fridays only—but not on Monday holidays) leaves the Bar Harbor Village Green at 8:00 a.m. For more information, visit www.downeasttrans.org, or call 207-667-5796. Both Greyhound (www.greyhound.com) and Concord Coach Lines (www.concordcoachlines.com) connect Bangor to Boston and Portland. The Bar Harbor Shuttle serves both terminals, while Downeast Transportation stops only at the Concord Coach Line terminal. The Hancock County-Bar Harbor Airport www.bhbairport.com) is only an hour away from the Bar Harbor Village Green by the free Island Explorer Campgrounds bus. Daily air service from Boston’s Logan International Airport (Terminal B) is available on Cape Air (partnering with Jet Blue for service beyond Boston) and Pen Air (providing daily service from Memorial Day through Columbus Day). In addition to the Island Explorer, several cab companies that run on Mount Desert Island (At Your Service Taxi, Bar Harbor Coastal Cab, Crystal Limousine) serve this airport. It’s only a 20-minute ride from this airport to the Bar Harbor Village Green by cab or the Bar Harbor Shuttle. The best way to get around when arriving in Bar Harbor is via the free Island Explorer (operating from June 23 until the 2nd Monday in October), which runs a total of seven routes around Mount Desert Island, including Acadia National Park. Visitors can visit the “quiet side” of the island at Southwest Harbor or Bass Harbor, and enjoy the views along Seawall or at the Bass Harbor Head Lighthouse. There are numerous hiking trails that can be accessed directly from the primary roads, and the Island Explorer does stop on request. The Island Explorer can accommodate bikes for accessing the 45 miles of carriage trails located throughout Acadia National Park. The carriage trails are closed to automobiles and are great for walking or biking. For routes and schedules of the Island Explorer, and other tips for exploring Bar Harbor and Acadia on the Island Explorer, visit www.exploreracadia.com. The Island Explorer serves hotels located on Route 3 on the way into Bar Harbor, so you are not limited to staying in town. Also, you can walk from any of these hotels to downtown Bar Harbor in just 20 minutes. Route 3 has sidewalks and is pedestrian-friendly. All of these hotels received high ratings from Trip Advisor. Acadia is easy to reach from downtown Bar Harbor. There are over 120 miles of beautifully scenic and impeccably maintained hiking trails, as well as 45 miles of carriage roads that are closed to automobiles. The carriage roads are great for walking or bicycling. The town of Bar Harbor has many museums, restaurants, and other attractions. In 2012, the American Planning Association selected Bar Harbor’s Village Green as one of their top ten Great Places in America for Public Spaces. The Abbe Museum, BH Historical Society, and George B Dorr Museum are all located in or near downtown Bar Harbor. The Sieur de Monts Spring and Nature Center, located at College of the Atlantic, and the Wendell Gilley Museum are easy destinations away from downtown Bar Harbor to access using the Island Explorer. Museum in the Streets Walking Tour of Bar Harbor focuses on the town’s history. This includes numbered signs that lead visitors along the shore path, through historic neighborhoods and downtown Bar Harbor. Great Meadow Loop, accessed from several Bar Harbor neighborhoods, takes visitors along the borders of Acadia National Park and Kebo Golf Course. A popular walk near town is out to Bar Island at low tide. For approximately 3 hours at the height of low tide a sand bar opens up that connects Bar Harbor to Bar Island, which contains a short (easy) hike up to a hill that overlooks town and the mountains of Acadia. (see the Bar Harbor Guidebook–http://www.agflipbooks.com/books/book.aspx?bookid=539). Several local residents with whom I talked recommend using Oli’s Trolley (a local company) to get an overview of the town, national park, and Mt. Desert Island (www.olistrolley.com. Phone: 207-288-9899). A guided tour can give you an overview and help you decide which attractions you want to see more fully later on. Oli’s Trolley offers 4 tours: Acadia National Park (2.5 hours), Cadillac Mountain (1 hour), Town of Mount Desert Tour (2.5 hours), and Downtown Bar Harbor (half hour). Visit www.olistrolley.com for tour details and reservations. Evan Sweeney has lived in Bar Harbor for 20 years and is a staff member at the Acadia Inn. He recommends visiting Seal Harbor (about 10-15 miles south of Bar Harbor, easy to reach on the Island Explorer) and walking along the carriage road that runs around Little Long Pond. Martha Searchfield, owner of Canterbury Cottage, suggests renting a bike and exploring one or more of the carriage roads in Acadia National Park. She recommends the Duck Loop at Witch Hole Pond. From there, get on the Connector to reach other carriage roads. Kristi Losquadro, co-owner of the Saltair Inn, suggests swimming in Lake Wood, Echo Lake, or Long Pond. Kristi Losquadro, co-owner of the Saltair Inn, suggests swimming in Echo Lake. You can get there on the Island Explorer. A staff member at the Jessup Memorial Library (Bar Harbor’s public library) suggests a walk along the Shore Path. The path is flanked by the ocean is on one side and old summer “cottages” (actually mansions) on the other. The staff member also recommends a visit to St. Saviour’s Church to see its tiffany windows. The College of the Atlantic is home to a natural history museum and an art museum. The 102-year-old Jessup Library itself, too, is worth a visit. Nicole Sargent, Guest Service Manager of the West Street Hotel recommends viewing either sunrise or sunset on top of Cadillac Mountain. “Be sure to bring a camera,” she advises. Several other companies offer kayaking tours. For more information and reviews, visit https://www.google.com/#q=kayaking+bar+harbor+reviews. However, Trip Advisor users seem to prefer Acadia Bike (www.acadiabike.com or call toll-free: 800-526-8615, or 207-288-9605). Acadia’s carriage roads are closed to automobiles and are good places to bike. Island Explorer buses allow bicycles. Both bike shops include a free map of the Acadia carriage roads, and will suggest specific outings based on your interests and skill level. Take the Island Explorer to Sand Beach and hike along the Sand Beach hiking trail to Great Head Trail. Here, a big cliff offers a marvelous view of the ocean. Visit Jordan Pond House—the only restaurant in the national park. Seafood, salads, popovers, and dinner entrees are served. Visit http://acadiajordanpondhouse.com, or call 207-276-3316 after June 1. Visit Cadillac Mountain. Unfortunately, the Island Explorer does not go to the mountain. However, two local tour companies offer tours that include stops at Cadillac Mountain and other highlights within Acadia National Park. For details and reservations, visit either Acadia National Park Tours (www.acadiatours.com or call 207-288-0300) or Oli’s Trolley (www.olistrolley.com or call 207-288-9899). Consider picnicking at the Seawall Picnic Area, across from the Seawall Campground. The Island Explorer makes a stop here. Use the Island Explorer to visit the west side of Mount Desert Island. The west side is generally less crowded than the more popular eastern side of the island. A unique way to enjoy downtown Bar Harbor and Acadia’s carriage roads is by a horse-drawn carriage tour. For information and reservations visit either http://carriagesofacadia.com/tours.html or call 877- 276-3622, or http://www.wildirishorsefarm.com or call 207- 288-5234. With an abundance of lobster coming in from the working waterfronts sprinkled along Mount Desert Island’s coastline, there is no shortage of opportunities to sample the local delicacy. The most traditional way to partake is at a “lobster bake,” which translates into a meal consisting of clam or fish chowder, steamed lobster and clams, corn on the cob, plenty of drawn butter and, of course, blueberry pie or similar sweet. Most restaurants offer some version of a “lobster bake.” Restaurants that specialize in these particular meals are referred to as “lobster pounds.” Here the lobsters are steamed in seawater over wood fired boilers, and dining rooms often are simply picnic tables outdoors. Many restaurants feature local music throughout the summer. The Bar Harbor Town Band plays on Mondays and Thursday starting July 1 in the Village Green Gazebo. The Bar Harbor Chamber of Commerce sponsors several summer events that include Taste of Bar Harbor, Father’s Day concert, Art in the Park, 4th of July Celebration, and a family movie series throughout July and August. The Acadia Night Sky Festival takes place in September. Reel Pizza (www.reelpizza.net or call 207-288-3828) is a favorite spot for local residents and visitors. It features both popular and foreign films plus a wide variety of pizzas and beverages which customers can enjoy on couches. Nichole Sargent, Guest Service Manager of the West Street Hotel, recalls: “I grew up near Bar Harbor. My dad’s a lobsterman and every year on July 4th my family and I would sit in my dad’s boat in Frenchman’s Bay and watch the fireworks explode above us; so naturally I became quite taken with Bar Harbor. “Try and see either the sunset or sunrise on top of Cadillac Mountain- bring a camera” and a picnic! For information about car-free travel to Bar Harbor, the Island Explorer routes and schedules, and ideas for trips and outings without a car, visit: www.exploreacadia.com. For a comprehensive list of attractions, places to visit, and local hiking trails, a highly recommended website is www.acadiamagic.com. This website is a great resource for anyone considering a visit here. Do you have a favorite getaway or vacation destination you would like spotlighted in a future Car Free Journey column? E-mail Steve at steveatlas45@yahoo.com. Steve also loves to hear comments and suggestions from readers about recent Car Free Journey columns. This entry was posted on Wednesday, May 21st, 2014 at 9:23 pm and is filed under Car Free Journey. You can follow any responses to this entry through the RSS 2.0 feed. You can leave a response, or trackback from your own site.